First off, if you haven’t seen Dario Argento’s “Suspiria” but have the unmitigated gall to call yourself a fan of horror, then you need to correct yourself before you wreck yourself. 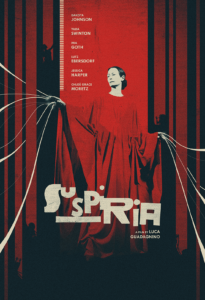 Whether or not you’re a fan of Argento’s brand of lurid neon “giallo” slashers, “Suspiria” is a film worth taking in, if nothing else for its garish art style and kickass soundtrack by prog rockers “Goblin”. Here, in as few words as possible, is the through-line of both versions of “Suspiria”: a young American woman is accepted into a prestigious dance school in Berlin which may be run by a murderous coven of witches. Gore ensues. But the director of the remake (Luca Guadagninof, who helmed last year’s gorgeous and atmospheric “Call Me By Your Name”) is now slouch. And he movie is nothing if not beautifully shot, and its full of terrific performances, including three — three! — by Tilda Swinton. But its not a simple horror movie like its predecessor. As for whether or not, dear horror fan, you should see the new version of “Suspiria” that came out late last year, well, that would depend on your appetite for — and tolerance of — self-consciously weighty pretension. Or, to put it differently, will you take some art with your violent evisceration? Because “Suspiria (2018)” distinguishes itself from its source material by being a different kettle of fish entirely. The original’s nominal mystery, that of whether or not the mysterious and clannish leaders of the dance school at which the film takes place are really a coven of witches or not. Needless to say, they are. The remake, for its part, foregoes such pedestrian mysteries; the school’s witchy bona fides are established quickly in the new version, with a supernatural dance sequence replete with various bodily fluids and the sound of crunching bone. So what you get instead, in the new art film version of “Suspiria” is a more textured portrayal of late-seventies Berlin, including references to the Baader-Meinhof group and to the lingering ghosts of Nazi Germany in West Berlin. And how creativity and destruction form an inextricable knot. Oh, and a portrayal of femininity in resistance to masculinity. OH, oh, and a whole lot of strange, abstract dance. But worry not, dear horror fan, for after nearly two and half hours of such arty goings on, it rewards you with a rollicking climax with a lot of screaming, a lot of dance, and a not insignificant amount of squelch. So ultimately, I think it will come down to how you prefer to take your horror: short, sweet and simple, or maybe outrageously ambitious and with a lot on its mind. If you prefer the latter, steer way, way, way clear of this new “Suspiria”. But if you don’t mind a little bloat with your art, well, then there really is a lot about it to love.